He isn’t wrong. It can be challenging to make vegan meals for omnivores that feel complete. I think of a smoothie as a meal, I could put the entire contents of our fridge in the Vitamix and my kids would still like a side of something on a plate with their smoothie. To make a vegan meal satisfying for omnivores it has to have a couple of different textures. I think that’s why the spring rolls are always successful, but a soup no matter how hearty, feels like a starter. This meal was my attempt to get my kids to eat chick peas. I am not sure why, but they hate them. I may have been a little aggressive with the hummus when they were little. I have a vague memory of packing many hummus sandwiches for nursery school. Also, as my son pointed out, chick peas look like naked buns and kind of taste like dirty water….in this house, chick peas were in need of some good PR. Typically, to encourage my family to like something new, there has to be a gateway food; something they like, which encourages them to try the new or previously rejected food item it is paired with. For this dinner, the gateway was potatoes, and guacomole. I used the medium sized white potatoes which I sliced slightly thicker than chips. I threw them in a bowl and added a can full of rinsed chickpeas. I marinaded the potatoes and the chickpeas in a dressing I had made from spring onions and grape seed oil. 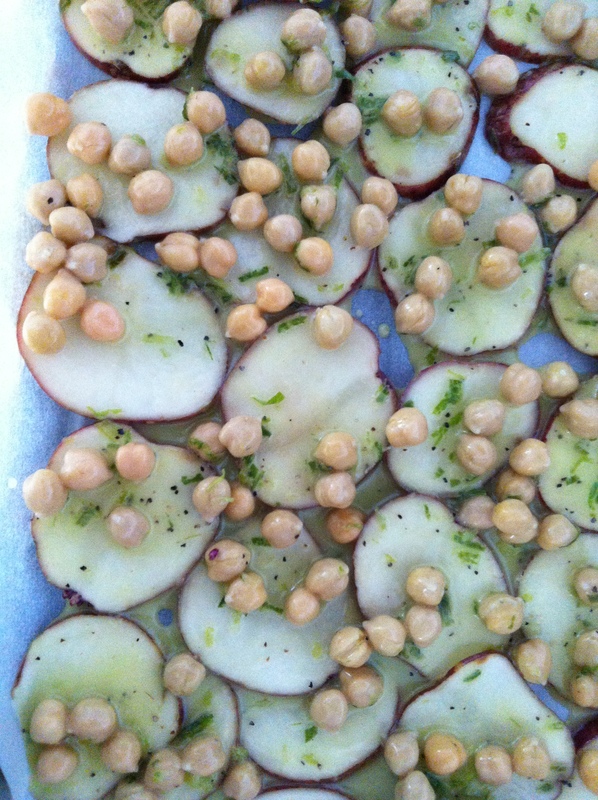 Bake both the potatoes and chickpeas in a single layer on parchment paper at 350 for about an hour, flip the potatoes after 30 minutes. 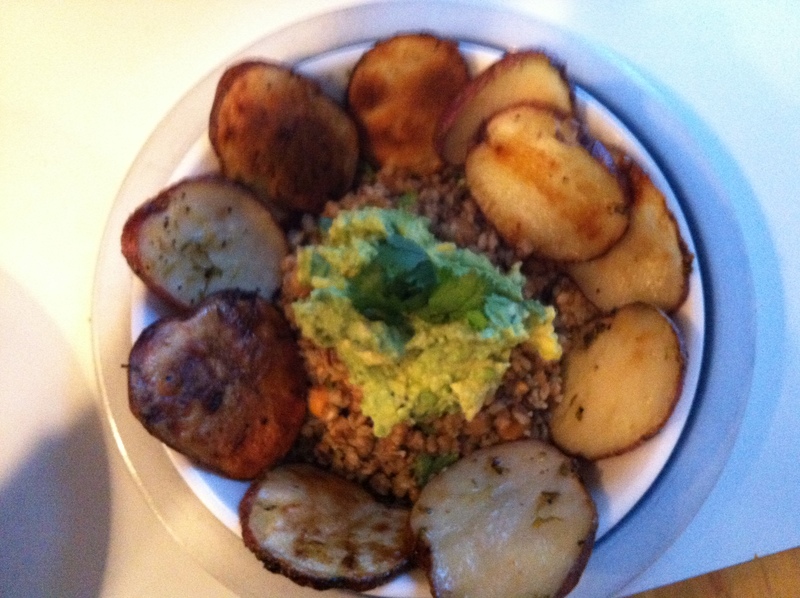 In this dinner, to vary the texture, I also made buckwheat, which is a great gluten-free grain. It is filling, and has a good nutty flavor. I use the Kasha brand and cook according to the directions on the box, for this recipe I added a cube of vegetable boullion to the broth. When the potatoes and chickpeas are done, I threw the chickpeas in with the already cooked buckwheat, and then lined the plate with the potatoes. Since the chickpeas were mixed in with the buckwheat, no one objected to their presence, and the potatoes were delicious enough that they got everyone going on the meal with gusto. The guacomole on top was perfect for dipping, and is a major family favorite. The avocado’s were a nice raw addition to an otherwise cooked meal. Blend using hand mixer, I also used a little fresh parsley in this but only because I had it in the fridge. Next postWhat do I do when I am really scattered?